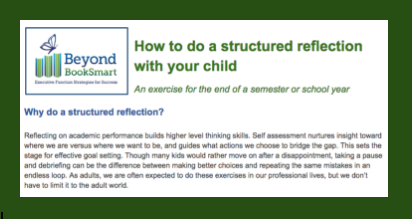 Why do a structured reflection exercise with your child? Reflecting on academic performance helps build a student's higher level thinking skills and sets the stage for goal-setting. This guide provides a step-by-step process to prepare, prompt, and record your child's reflection of the past semester or school year. Complete the form to the right to download our Structured Reflection Guide.